Veronicas come in all sorts and sizes. A couple of months ago this space featured one from the high, dry mountains of the marches between Europe and Asia. 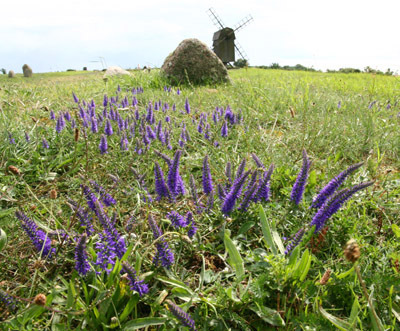 This month's Veronica spicata grows widely in lowland Europe; it is the county flower of Montgomeryshire in Wales. The two upper pictures here were taken on the Swedish island of Öland, in the Baltic sea. 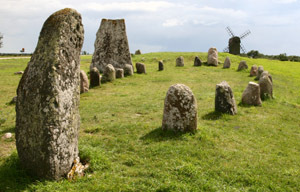 Öland has a limestone pavement with some similarities to the Burren, and the island is famed for its orchids. These were mostly gone by the time the veronica was photographed in August, but the bronze-age stone burial monuments remain always. Reminiscent of the circles in Ireland and elsewhere, but distinctively ship-shape. 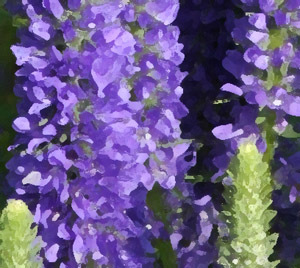 In our garden is Veronica spicata which was photographed in full flower in early July, and still shows blue at the tips of the spikes in early September. This may be "Ulster Blue Dwarf", which is fairly widely distributed among our members. The recorded existence of this clone begins in John McWhirter's garden - he was given it 'by an old lady'. 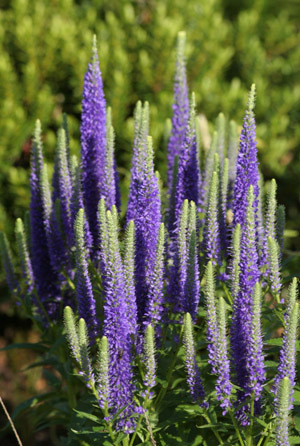 Ulster Blue Dwarf is an excellent and easy plant, compact and long-flowering.